Does this belong to anyone? Does it belong to anyone here? Re: Does this belong to anyone? 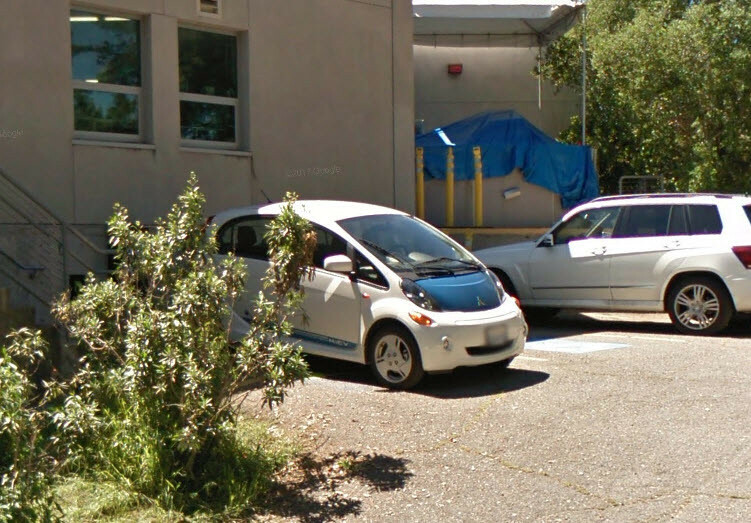 I did a double-take, but I have "100% Electric" on the front bumper and no license plate - and I haven't been up to that Chabot facility, but it looks like an interesting place to go up to for a daytrip. We have to recognize that only a tiny fraction of i-MiEV owners actually participate on this forum, but maybe a lurker will own up? Thanks for the post. If I could check out the contents, I would, but this is a screenshot from Google Maps so I wasn't actually there to take the picture. I'm surprised that Google bothered to drive down this road. They certainly are thorough. I donated a telescope to the Chabot Space & Science Center "Telescope Maker's Workshop" so I needed to find the entrance to their workshop. I just stumbled upon the i-Miev while searching. When I first saw it, I wondered if it was Joe's. A woman in Oakland has one like this. I can't remember her name but she let me test drive hers 3 years ago which lead to me buying a used 2012. In fact, I will have had it 3 years next month. 2012 ES, Cool Metalic Silver, no quick charge, no fog lights and no navi but a cold weather package for when it gets 13 below, wait - it never gets that cold here. This is just the 4th i-Miev I've seen in the wild and I didn't actually see this one in person.